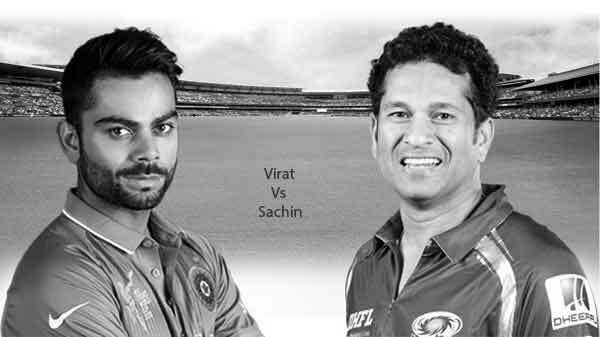 Can Virat break Sachin’s Record? Sachin Tendulkar is regarded as the ‘God of Cricket’ and there are reasons for it. In the early 90’s, the Indian team was not rock solid in terms of batting. India had a weak opening pair and an average set of players who played at no.3, 4, 5 and later on. But then also, we were confident because of one player and that was ‘Tendulkar’. People switched off their TV sets when he used to get out. He gave us the hope of winning. He was able to counter any bowling attack and in the process created many records. He surpassed the records of number of centuries scored in test and one day internationals. Also the total number of runs scored in ODI and Tests. Till now, even after 4 years of his retirement none of the batsman have been able to surpass any of his records. But now his legacy is being challenged by the star batsman from Delhi – ViratKohli. When I was writing this article on 2/17/2018,Virat was on the verge of completing his 35th century. Till now, Virat has placed himself as a strong contender to beat Sachin’s record in ODI’s and Tests. In Tests, he scores 5554 runs in 66 matches at an average of 53.4 with 21 centuries and 16 half centuries. His highest score is 243 runs. In ODI’s he scores 9588 runs in 208 tests at an average of 58.1 with 35 centuries and 46 half centuries. His highest score in ODI is 183 runs. Most number of Test matches played i.e. 200. Most number of runs in ODI i.e. 18426 runs. Most number of runs in Tests i.e. 15921 runs. Most international runs in all formats i.e. 34357 runs. Question arises now that can Virat be able to surpass all the records of Sachin? Let’s look at the ODI scenario. Virat is most likely to play till the 2027 world cup as he will be 38-39 years old till that time. So it will be 9 more years before he retires from the ODI format. In the last 5 years he has played 111 ODI’s. So that comes to an average of 22 matches every year. So in the next 9 years he is likely to play 22*9 i.e. close to 200 ODI’s. Statically Kohli scores a hundred in every 6 match. So if he plays 200 ODI’s then he is likely to score 33 ODI hundreds. Hence there are strong chances that he will break the record of most hundreds scored in ODI. By the end of his career he is expected to get 68 hundreds. Total number of runs scored by Kohli in the last 5 years is 5144. So that comes to an average of 1000 runs every year. So breaking the record for most number of runs in ODI is going to be tough call as the total number of runs scored in 9 years will be 9000. By the end of his ODI career he is likely to get 18000 runs. When it comes to test, Kohli averages 875 runs in the past 5 years. So by assuming that he will continue playing test matches till 2027, his run tally be somewhere between 13 to 14 thousand runs. Also Kohli has been able to get a century in every 3 test matches that he plays. Assuming that he plays 10 matches every year then in 9 years he will be playing 90 matches. He will be able to score 30 centuries in it. So he is most likely to equal the record of Tendulkar in terms of number of centuries scored. To conclude on a statistical basis, Kohli can break few records of Tendulkar but it is too early to say. Most important assumption that is made behind all this calculations is he staying fit or else their will be a premature ending to his career. Next post: 5 Amazing Facts You Never Knew About Winning the 1983 One-Day World Cup!